Well this makes my blood boil. For President Obama to come out and tout smart spending and being frugal is a joke. This is the same man who seems to take lavish vacations on a monthly basis, has played 70 rounds of golf since taking office, has increased the govt’s limo fleet by 70%+, and travels with an insanely large entourage. I don’t begrudge keeping a President safe, but if its that dangerous to travel that he needs 500 people with him, perhaps he shouldn’t travel so often when it isn’t really necessary! Then there are the chefs and fitness gurus he flies in from Chicago on a regular basis, the date nights that cost more than most people make in a lifetime, and the parties that are tastelessly outlandish given the state of our economy. 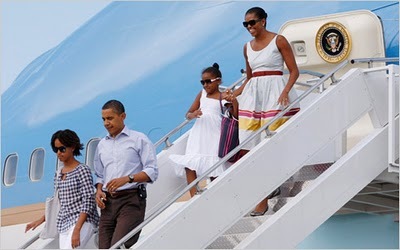 Don’t forget Michelle, the travel planner in chief, that views your pocketbook as her personal vacation spending account, spending millions on unneccessary trips just because she can. The Obamas are the definition of EXCESSIVE. Earlier today, President Obama popped into the White House Personal Finance Online Summit, where our own Meg Marco was in attendance. Speaking to the small group of writers, the president offered up his advice on personal finance.”Don’t spend all your money,” he joked.He did share some advice learned from his grandmother, who was one of the first female vice presidents at the Bank of Hawaii: “Save a little bit of whatever your earning and the magic of compounding interest applies. He relates the story of his family’s first starter home, a condo that, in spite of the high payments, was still a good investment. “[The] same goes for the nation,” he said, naming education and infrastructure as “sound investments” for the country.Added Obama, “There is a distinction between spending on things that will increase your productivity and your wealth” and spending on things you merely want. via Obama: Personal Finances And The Nation’s Finances Aren’t So Different – The Consumerist. The narcissistic hipocracy is off the charts. « Ultimate Irony: Weiner says watch out for internet perverts!